Daily maize porridge gives well-being and happiness. We house, nurture, support and educate 35 girls at Emmanuel and Mumaso Houses. Vincent and Isaac are the next generation of quality Ugandan gentlemen. They now have medical insurance and have started their own little businesses through the money they have made in selling us the beads. Runner ben is a bout to begin vocational training as a plumber. Paul Kiiza has learnt to read, write, sign and is in his final year training to be a carpenter. The Hen House Ladies in Masese make hand-rolled, recycled paper beads. Currently we are their only buyers. Enjoying a sip and chat in the shade. Look on Etsy under Source of the Nile to purchase, or contact through this website. We also buy beanie-beads from the innovative Winnie in our House, and beautiful bags. 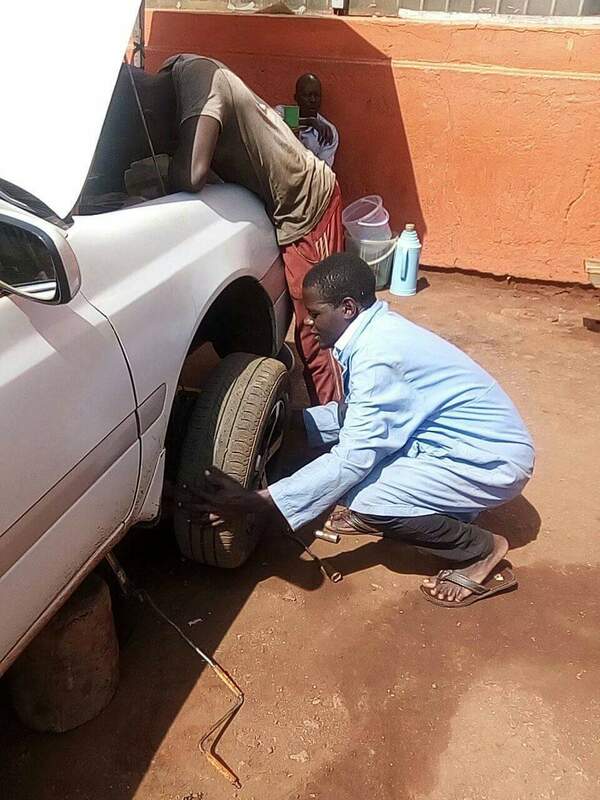 Our very dear Ogobi VINCENT is now a trained and qualified Automotive Mechanic.